In these files, only the references that are cited in that chapter are included (unfortunately, they are renumbered). The page numbers, however, should match the complete book copies. [pdf] Motivation, examples, applications, high-level planning concepts, overview of the book. 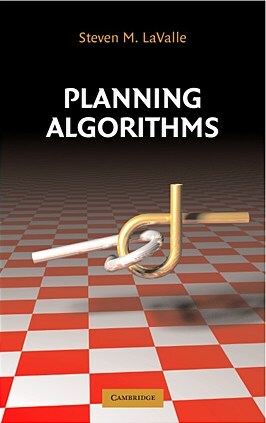 [pdf] Feasible planning, optimal planning, search algorithms, A*, Dijkstra's algorithm, forward search, backward search, bidirectional search, value iteration, logic-based planning, STRIPS, plan graph, planning as satisfiability. [pdf] Polygonal, polyhedral, and semi-algebraic models. Rigid-body transformations, 3D rotations, kinematic chains, Denavit-Hartenberg parameters, kinematic trees, nonrigid transformations. [pdf] Topological spaces, manifolds, paths. The C-space of rigid bodies, chains of bodies, and trees of bodies. Configuration space. Quaternions. C-space obstacles, closed kinematic chains, algebraic varieties. [pdf] Metric spaces, measure, random sampling, low-discrepancy sampling, low-dispersion sampling, grids, lattices, collision detection, Rapidly-exploring Random Trees (RRTs), Probabilistic Roadmaps (PRMs), randomized potential fields. [pdf] Vertical cell decomposition, shortest-path roadmaps, maximum-clearance roadmaps, cylindrical algebraic decomposition, Canny's algorithm, complexity bounds, Davenport-Schinzel sequences. [pdf] Time varying problems, velocity tuning, multiple-robot coordination, hybrid systems, manipulation planning, protein folding, unknotting, closed chains, Random Loop Generator (RLG), coverage planning, optimal motion planning. [pdf] Navigation functions, smooth manifolds, vector fields, numerical potential functions, optimal navigation functions, compositions of funnels, dynamic programming on continuous spaces. [pdf] Optimization and probability review, games against nature, Bayesian classification, zero-sum games, nonzero-sum games, Nash equilibria, utility theory, criticisms of decision theory. [pdf] Sequential games against nature, value iteration, policy iteration, infinite-horizon planning, discounted cost, average cost, reinforcement learning, sequential games. [pdf] Information spaces and information mappings, sensing uncertainty, discrete and continuous sensors, POMDPs, Kalman filtering, particle filtering, information spaces in games. [pdf] Value iteration for planning under sensing uncertainty. Robot localization, mapping, navigation, searching, visibility-based pursuit-evasion, manipulation with sensing uncertainty. [pdf] Kinematic constraints, Dubins car, Reeds-Shepp car, differential drives, a car pulling trailers, phase space, rigid-body dynamics, dynamics of a chain of bodies, Newtonian mechanics, Euler-Lagrange equation, variational principles, Hamilton's equations, differential games. [pdf] Phase-space obstacles, nonholonomic planning, kinodynamic planning, trajectory planning, reachability analysis, motion primitives, sampling-based planning, Barraquand-Latombe nonholonomic planner, RRTs, feedback planning, plan-and-transform method, path-constrained trajectory planning, gradient-based trajectory optimization. [pdf] System properties, stability, Lyapunov functions, controllability, STLC, Hamilton-Jacobi-Bellman equation, Pontryagin's maximum principle, Dubins curves, Reeds-Shepp curves, Balkcom-Mason curves, affine control systems, distributions, Frobenius theorem, Chow-Rashevskii theorem, Lie brackets, control Lie algebra, P. Hall basis, steering with piecewise constant inputs, steering with sinusoids.